Although options to delete records are available in most parts of Tessera there will be occasions where you are advised that deletion of a record isn’t possible. In the People Component this will occur when the person is an Artist or Owner and their record is already in use elsewhere in Tessera. For example, if their record is attached to an invoice. An invoice can’t be deleted if there are items entered or payments made against it. You’ll be given feedback as to why deletion isn’t possible and suggestions as to what to do next. Anywhere deletion of a record is possible use the Delete button. 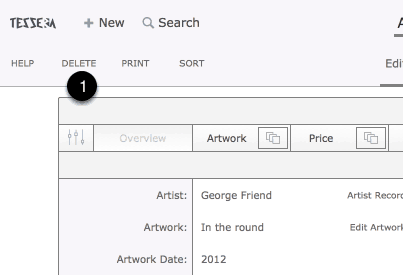 In the Artwork and People Components you have the option of deleting more than the current record by then using the More button presented after you’ve used the Delete button. If you make this selection Tessera will delete only those records in the current found set that can be deleted, leaving untouched records that would not have been allowed to have been deleted individually.